LOOP — La-Dee-Dahs are having their day. The chocolate-dipped swirls of salted caramel and white chocolate nougat have made it into the pages of O and Food & Wine magazines and, just this month, Bon Appetit. 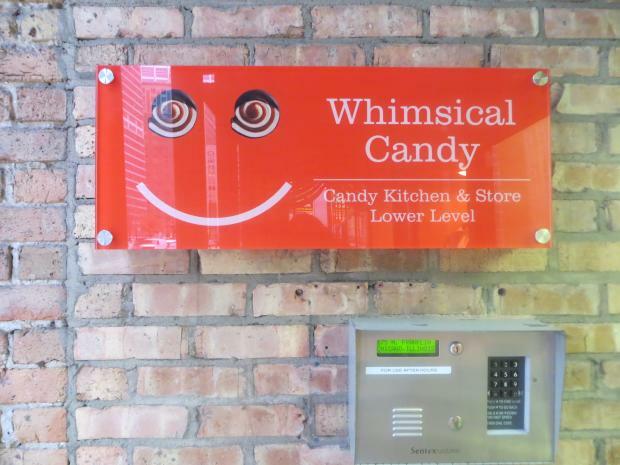 And after five years of production in a shared kitchen on the West Side, the candy and its maker have a new, permanent home in the Loop. Chris Kadow-Dougherty opened her Whimsical Candy shop last week in the basement at 175 N. Franklin St. It's an odd location, Kadow-Dougherty admitted, beneath a few law and architecture offices, a sandwich shop and a nail salon. But it's fitting — the building once housed DeMets Candy, the maker of Turtles. Down the stairs and down a short hallway, behind glass windows looking into the bright and tidy shop, Kadow-Dougherty cranks out some 600 La-Dee-Dahs by hand daily, among other treats. "I'm hoping tourists will come. There aren't a lot of places in Chicago where you can see candy being made," she said Monday as she cut layered strips of caramel and nougat with a chef's knife. This is a second career for the 44-year-old Kadow-Dougherty. On her days off from her previous job at a nonprofit, she would bake all day. She took that as a sign that something had to give. So she quit her job, enrolled at the French Pastry School, fell in love with candy-making and started a company built around her signature sweet, the La-Dee-Dah. She also makes plain caramels and two types of nougat. She sells her sweets online and wholesale to specialty shops in Chicago and nationwide. But her new shop, open from 11 a.m. to 6 p.m. Monday through Friday, is the only place to find limited-edition treats, such as La-Dee-Dahs with coconut and almond nougat. Interns from the French Pastry School, just a few blocks away, are working with Kadow-Dougherty on a Whimsy Pie. It's a play on the Whoopie Pie, with a chewy salted caramel and buttercream filling sandwiched between chocolate cake layers. She plans to have it at the store in January. The space was designed by New York candy historian and author Beth Kimmerle, who was one of Kadow-Dougherty's first customers. "I really like her attention to detail. That's one thing that makes her items stand apart from the rest," Kimmerle said. "And I'm a big fan of nougat and caramel separately, and what she does with them together is sort of magic." Kimmerle, who does marketing and branding for candy companies big and small, connected Kadow-Dougherty with the children's retailer Land of Nod, which in turn donated merchandise to help furnish the store. Toy suitcases are a key decorative element. When Kadow-Dougherty was a toddler, she says she packed a suitcase and tried to run away to the candy store down the street. She has ended up where she always wanted to be. "I'm so lucky to be able to do this," she said.